What do we know about how SBI (aka IBA) may impact on health inequalities? The evidence we have so far is fairly limited on this. There has been a suggestion that effectiveness may be less well-proven for women for example, but little conclusive in relation to SBI for those from lower socio-economic groups. As those interested in SBI/IBA, we need to be aware of to whom the SBIs are being delivered. I would love to see an analysis of the socio-economic characteristics of those for whom it has proven effective and comparing that to different lengths of intervention. Until we have that, I think we need to be taking a careful look at how mass delivery of SBI might impact on health inequalities. If those who are most likely to engage with it, are those who are least in need in general, then it is possible that SBI will increase health inequalities. No mention of socioeconomic deprivation or health inequalities though – this would seem a clear gap in what we know and something we should be mindful of. Briefing Paper 23: The development of a framework for monitoring and reviewing health and social inequalities. 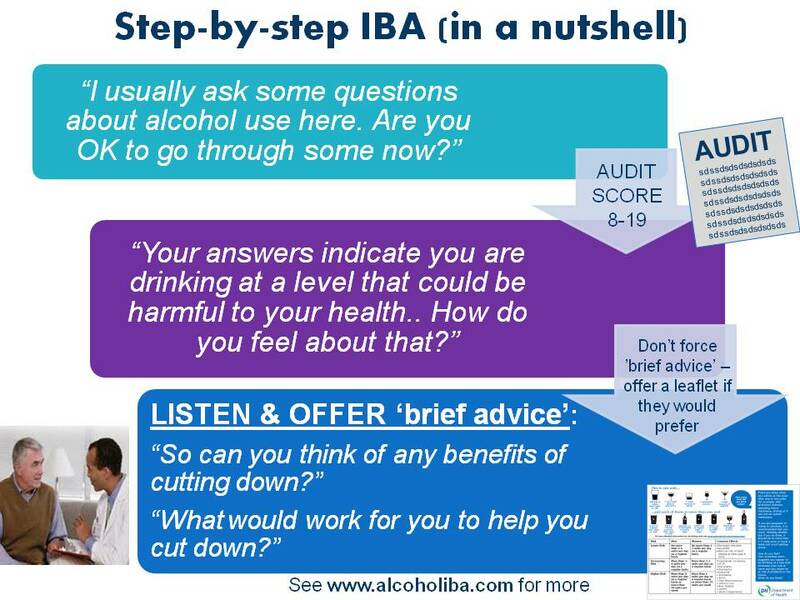 See here for a PDF version of IBA in a Nutshell. For a more detailed look at IBA see our About IBA or IBA skills pages. As our readership grows we want to keep improving the blog. We’ve had some feedback the old look was maybe a bit ‘crowded’. What do you think, is this an improvement? We’re going to give it some further tweaks, but hopefully you’ll like the new look. But please leave a comment below if you have a preference!